Reduce Inrush & Light Flicker caused by Compressor Cycling! Superior Technology & Supplies Corp. introduces the new 1P100-ST soft start. IntegraPower is the only specially engineered SCR Soft Start that will meet mandatory Rule 2 compliance for Maui County or other Municipalities that require limiting Inrush below 100 AMPS. This is also the only Soft Start that is approved by Rheem Manufacturing Company® for use on their new or existing 4 & 5 ton Air Conditioners, without violating the WARRANTY. Available for After Market and New OEM applications, the 1P100-ST uses the latest Digital Signal Processor (DSP) and is easily connected in series between the energy source and motor, making the installation fast and easy. The Soft Start feature is optimized through advanced proprietary software used to program the Texas Instruments solid state DSP. 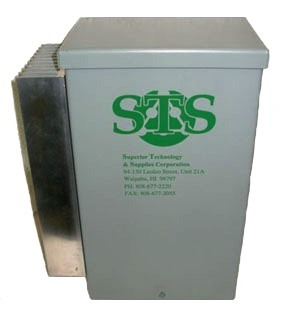 This solid state, NASA inspired technology incorporates silicon rectifier switches, which will deliver years of reliable and maintenance free service. Rheem Manufacturing Company® has approved the 1P100-ST soft start after extensive testing and Copeland® inspected the AC compressor that was tested, which revealed no unusual wear or damage. For more information contact Superior Technology & Supplies Corp.